No party or gathering is complete without salad recipes for a crowd. Crisp and fresh green salads can be the perfect start, finish or accent to any meal. When shopping, our choices of salad greens are greater in our supermarkets than ever before and yet many people never include anything beyond a basic lettuce when looking for cooking for a crowd recipes. Salad recipes for a crowd can range from the basic appetizer tossed salad, the classic Caesar with romaine lettuce to a very contemporary Radicchio with butter lettuce providing a green salad for every taste. Then we have the salads with added vegetables making a colorful combination for guests appeal. Many of these strikingly beautiful salads are so easy to assemble. Small salads might be served as a side, maybe with sandwiches for a crowd or in large bowls, perhaps on a buffet table. We also have delicious salad recipes for a crowd made with all fruits or with fruit added to greens and vegetables. Blending the flavors of fruits with the vegetables offers your guests and unusual and distinct taste. Meats and cheeses are added to many salads; often providing a full meal. Whatever you decide, these dishes are open to your imagination. By adding a variety of colors to your salads the eye appeal magnifies. I make it below, 7 layer salad recipe, it is one of my favorites; I make it quite often when cooking for a crowd. I almost always add it to all my buffet dinners because it is also one of my family’s favorites. I love the dill flavor in the salad. Not only is this recipe delicious but it makes a beautiful presentation when arranged in a large clear glass bowl. (A clear glass punch bowl works well). I am also giving you a citrus salad recipe which is also delicious; this combination is simply wonderful. First the mixture of lettuce, onion and avocado with strawberries and oranges is tasty in itself. Just look at what is in this heavenly dressing; think about pouring it over that great mixture of fruit and vegetables. Then it is topped with sweet pecans. Guests are astounded over this salad recipes for a crowd. 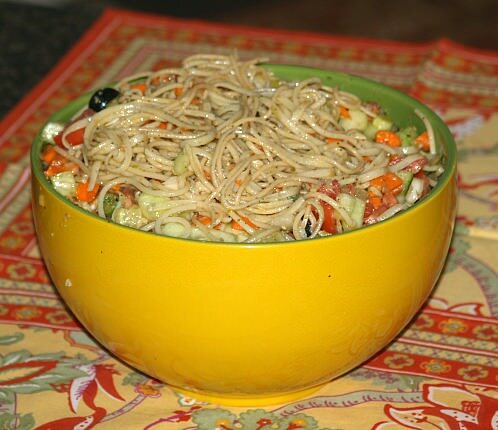 Spaghetti and potatoes are favorite dishes at every gathering and this is also true when it comes to salads. Both the pasta crab salad and the blueberry salad recipe are always popular. It seems everyone loves crab and they love blueberries so I can’t say much more than they are both fantastic. 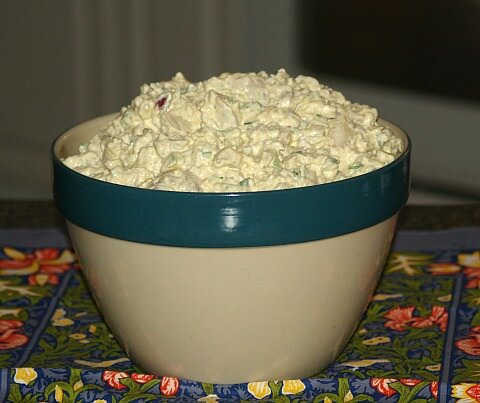 When making salad recipes for a crowd decide if you want salad recipes to go with the main meal or something to serve as a light dessert like the blueberry salad recipe. Guests often appreciate a light dessert after eating a heavy meal so this type is nice to offer. Although light, the blueberry salad recipes for a crowd has a lot of flavor and texture. When you need a salad dressing recipe, remember that a perfectly blended dressing lends the final touch to a salad. It should pull all the ingredients together in perfect harmony. Traditionally the basics start with a good oil and vinegar; this could be one of many nut oils and some flavored with herbs. The perfect choice of a salad recipes for a crowd. This is always a favorite at church dinners hence its name. In a very large bowl or container begin with a layer of shredded cabbage. Add a layer of sliced potatoes over the cabbage; sprinkle seasonings over the potatoes. Add a layer of onions, a layer of peppers and a layer of eggs; now spread a layer of mayonnaise. Continue making layers until all ingredients are used; cover and refrigerate at least 24 hours. Before serving mix well all ingredients. Serves 18 to 20.
great choice of a salad recipes for a crowd of kids. Kids always love spaghetti and the added vegetables make this a favorite of the parents. Break spaghetti into small pieces; cook and drain well. First put shredded lettuce in large bowl. Add layers of green peppers, then celery, then onion. Add green peas evenly in layer. Spread mayonnaise over the green peas. Sprinkle sugar over the mayonnaise; then sprinkle chopped dill after the sugar. Top with Swiss cheese and then top with crumbled bacon. Set it on buffet layered like it is; it makes a pretty presentation. As guests begin to serve themselves, right before serving, toss it all together to blend. Mix sugar with pecans in a small skillet; cook over low heat until sugar melts, stirring to coat pecans. Spread on foil to coat and cool; break pecans apart. Combine oil, lime juice, orange juice, sugar, lime zest and orange zest in a jar with lid and shake well; chill until ready to serve. 2 Large oranges peeled and sliced thin and cut in half. 1 Quart fresh strawberries cleaned and cut in half. Combine lettuces, onions, orange slices and strawberries in a large salad bowl and toss gently; chill until ready to serve. Add avocados to salad right before serving; drizzle with citrus dressing and toss gently. Top salad with sugared pecans. When making salad recipes for a crowd I think this recipe is best served in individual salads; it makes 18 to 20. If this is not possible for your cooking for a crowd, then arrange the pasta in a large flat shallow dish. Then pour the sauce mixture over the pasta and arrange the crab meat on top. Sprinkle the chopped basil over top for garnish. To make sauce for salad roast bell peppers under broiler until blackened; peel skin off under cold running water. Remove seeds from peppers and place in blender or food processor; add vinegar, sugar, cayenne and olive oil. Blend mixture until completely pureed. Cook pasta in boiling water until tender; drain and rinse in cold water. Toss pasta with a little olive oil to keep from sticking. This is best served in 18 to 20 individual salad plates. Pour sauce on salad plate, arrange pasta on top, place a little crab on top and garnish with chopped basil. Mix Jell-O with boiling water; stir until dissolved. Blend in pie filling and pineapple; pour into two flat casserole dishes (approximately 9 X 13 inches) and set in refrigerator until mixture sets. Combine sour cream, cream cheese and sugar; beat until well blended. Fold in Cool Whip and nuts; spread over top of Jell-O mixture. Chill until top sets before serving.